Remember how Bubby had a totally sweet princess party a few months ago? Remember the AMAZING cake and cupcakes my friend and neighbor Jen from DeKadent DesignZ whipped for the occasion? I sure do. And I don't think I'll be forgetting them any time soon. Because hello, not only were they GORGEOUS but they were the tastiest, most moist and fluffy cakes I've ever eaten. EVER. And I eat a LOT of cake. Not only are her treats scrumptious, but Jen is an artist! She can do whatever you want, and I mean whatever. She's a regular culinary genius! Jen is so generously donating two dozen cupcakes to Stacy's Auction. Thank you, Jen! 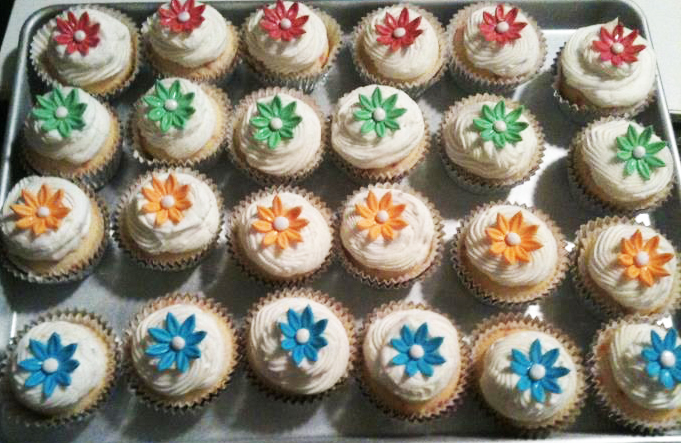 The winner* of this auction will receive ONE DOZEN cupcakes, customized to their liking. There is a second auction for another dozen here. THIS ITEM IS VALUED AT $12.00 BIDDING BEGINS AT $5.00 AND SHOULD INCREASE BY A MINIMUM OF $1 WITH EACH BID. *DeKadent DesignZ does order for the Phoenix metropolitan area.